That's right, folks, only 2% of American gamers have visited a virtual world. However, if you're just looking at teenagers, around 10% have visited a virtual world. Meanwhile 43% of all adult gamers (or 23% of all adults) play online games. For teens: 76% of ALL teens play online games. Just under a quarter (23%) of all adults play games online. Put another way, some 43% of adult gamers play online games. Adults are much less likely to play games online than teens, as about 76% of all teens play games online and 79% of teen gamers play games online. As with all games, younger adults are more likely to report playing games online than their older counterparts. 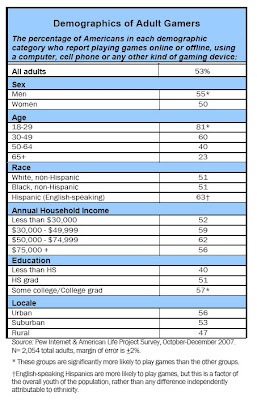 Fully 43% of adults ages 18-29 play games online, compared with 26% of people ages 30-49, 13% of people ages 50-64, and 5% of those 65 and older. Respondents who report playing games online tend to play more often than gamers who do not play games online. The majority (59%) of online gamers play at least a few times a week, significantly more than the 41% of strictly offline gamers who play that often. Those who play massive multiplayer online games (MMOGs),5 such as World of Warcraft, are even more likely to play frequently, as 89% play at least a few times a week.6 Nearly half (49%) of MMOG players play everyday or almost everyday, while just one in four online gamers (26%) and 17% of offline gamers play as often.